Just 20 minutes north of downtown Calgary on Hwy 2 (QE II) and 5 KM north of the Calgary International Airport. Take Highway 2 (QE II) south to Highway 566 exit. Take 566 east to CrossIron Blvd. and head south. Destination will be on right. Take Highway 2 (QE II) north to Highway 566 exit. Take 566 east to CrossIron Blvd. and head south. Destination will be on right. You also have the option of taking the CrossIron Drive exit. Take Highway 566 west. At CrossIron Blvd. make a left at the lights and head south on CrossIron Blvd. Destination will be on right. Take Highway 566 east. At CrossIron Blvd. make a right at the lights and head south on CrossIron Blvd. Destination will be on right. Take Deerfoot Trail/Highway 2 north to the CrossIron Drive exit then turn left on CrossIron Blvd. Destination will be on left. Take Stoney Trail to Deerfoot Trail/Highway 2 north. You will have the choice of taking the CrossIron Drive exit or the Highway 566 exit. If you take the CrossIron Drive exit, turn left on CrossIron Blvd and destination will be on left. If you take the Highway 566 exit, take 566 east to CrossIron Blvd. and head south. Destination will be on right. HERE'S ADDITIONAL WAYS TO GET HERE. Airdrie Transit is now providing daily service between Airdrie, CrossIron Mills and Calgary. 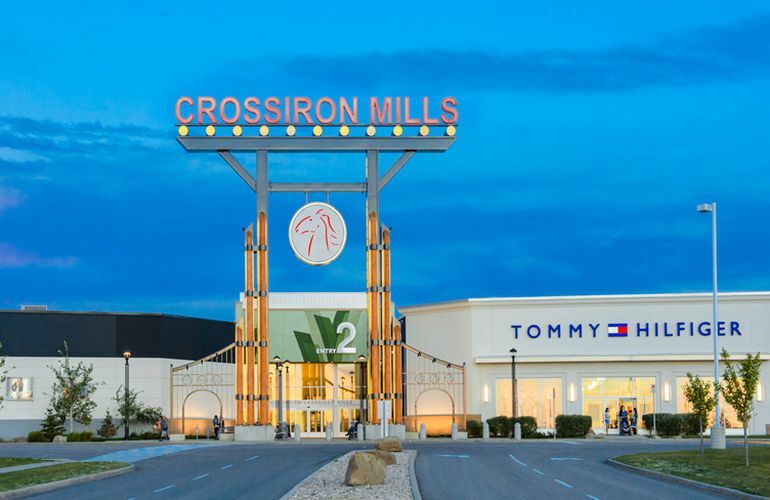 The CrossIron Mills Employee Shuttle tickets/passes will be accepted as full fair on Airdrie Transit Routes that include a CrossIron Mills stop. The fare is determined based on destination - CrossIron Mills, McKnight-Westwinds LRT or Airdrie. The fare is $3.00 from Airdrie or Calgary to CrossIron Mills one way and from Airdrie to Calgary or vice versa is $5.00 one way. Transit schedules are created at the discretion of Airdrie Transit. This route runs from 2 stops in South Airdrie to CrossIron Mills to Peter Lougheed Centre & Rundle Station LRT in Calgary and back. The Airdrie stops are South bound Main Street at Sierra Springs Dr. (Wal-Mart) and North bound Sierra Springs Dr. near the Co-op Gas Bar. For additional information, please call CrossIron Mills Guest Services centre (403) 984-6800 Guest Services operates in conjunction with mall hours.